Cassandra Clare has written a beautiful, perfect love story, it’s just such a pity that not much else in this trilogy is worthy of the same commendation. This was a hard review to write, and for fans of this trilogy it might be hard to read. But I’ll say up front that for all my criticism I did find reading this series entertaining, and some of the characters are truly wonderful and memorable. It’s just that those things are not enough for me to overlook the rest of the issues that I had. Having read the trilogy over the course of a few months I strongly feel that there was a story worth telling in there somewhere, but not enough to justify a whole set of three books. There are some beautiful passages and incredible quotes, Clare has a real flair for ‘quotable’ phrases. But there is so much about the series that is unnecessary. It had me wondering about the context in which it was written. I don’t know enough about Clare and the Shadowhunters fandom to say for sure, but at times this series felt like the kind of fan-service found in anime series that have their own in-jokes, and information is included for a purpose outside of the actual plot of this series. When reading a novel readers are happy to accept one or maybe two ‘miraculous’ events, but when the impossible becomes possible over and over again those miracles lose their narrative power. That’s how I felt reading the Infernal Devices, by the end I could no longer care about the dangers or risks the characters were exposed to because I just assumed that Clare would invent some ‘miracle’ to save them or defeat an enemy, or turn the tide in every single battle. For that reason, amongst many, I won’t be reading any more of Clare’s works. I think it is unfair to those who love her work for me to read something that I know I am not going to enjoy. That’s not why I read, and I don’t want to set out to diminish other’s enjoyment. 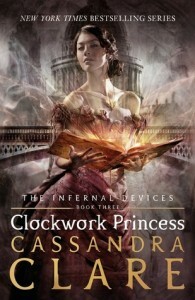 If you’ve read Clockwork Princess and would like to read my in-depth review with details of this book (including spoiler tags!) you can view it on my Goodreads here. Hair curling at people’s temples or the nape of their neck due to sweat or humidity. This happens dozens of times throughout all 3 books, I understand the impulse to create some kind of visual atmosphere, but it is repeated so often that it becomes redundant. Are Shadowhunters really so sweaty? !